Gary Ewing (Ted Shackeford) joins the family to support Christopher at the racetrack. Christopher feels the need for speed when NASCAR champion Ricky Rudd puts the Ewing Energies racecar through its paces to win a crucial contract with the DCT for Team Christopher in a high stakes game against Team John Ross. J.R. tells John Ross he’s working on a deal in Abu Dabi that will help them pull ahead of Bobby and Christopher. Later, it seems like old times as the Ewing Energies conference room is turned into a battle field where Chris and his father square off against John Ross and Sue Ellen while Pamela emerges as the deciding vote in their struggle pitting oil against methane energy. When Sue Ellen refuses to return Elena’s shares, Bobby reveals an injunction his brother Gary helped him get against drilling on Southfork. 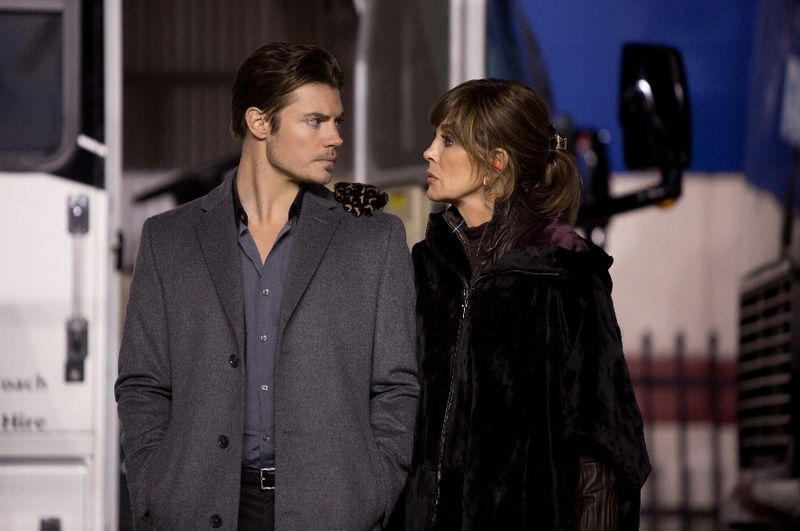 Chris convinces Pamela to give him a chance to prove the viability of methane on the racetrack and she tells John Ross to back off so that she and her father Cliff can protect their investment in Ewing Energies. John Ross predicts she’ll be changing her tune soon and gives his uncle Gary from Knots Landing a very chilly reception at the office. Gary isn’t impressed by John Ross’ second-rate J.R. imitation and relishes blowing off his disrespectful nephew. To Bobby, however, Gary admits he would greatly feel the financial pinch of a closed down Ewing drilling operation and shares that he fell off the wagon last year, causing his wife Valene to leave him. Bobby promises to lend him money in exchange for his support. Sue Ellen takes a different approach to Gary, batting her ever-expressive eyes at him and coyly suggesting they attend the Ewing Energies race together. Oil drilling weighs heavily on the minds of the Ramos siblings, too. Elena is livid that Pamela has replaced her the feminine third of Ewing Energies thanks to Sue Ellen’s spiteful move and Drew is equally passionate about the oil deposit in the site their father failed to bring in. His site tests reveal the land is indeed rich in oil and he convinces Elena to join him in a Ramos venture that would profit them both without any intervention from the Ewings. John Ross is busy plotting, as usual, and J.R.’s detective unearths a mechanic on Christopher’s pit team who is deeply in debt. How convenient! John Ross pays the guy a visit and the mechanic makes a menacing appearance at the garage when Christopher’s crew leaves for the night. At Harris Ryland’s home, Emma is annoying her father with her growing interest in getting to know Ann. He arranges for Mother Ryland to fly her back to England the next day to resume her equestrian competitions. Emma is more interested in learning to loosen up with her mother riding Western-style on the Southfork range, feeling free for the first time in her suppressed life. Harris feeds Emma meds to balance her “anxiety attacks,” but the next morning his precious daughter has flown the coop. When Judith berates him for losing his hold on “their” daughter, he pushes her aside and admits he fell for Ann “because she wasn’t you!” Mother Ryland is devastated. John Ross and Sue Ellen are facing a bigger loss than the one they endured at the race. At the racetrack, Ricky Rudd tears up the track in the Ewing Energies car as the Ewings look on in anticipation. At a crucial point in the race, the car’s pressure regulator starts acting up (big shock!) and Ricky Rudd loses his lead while the pit crew attends to the issue. Getting back on the track, Ricky floors it and wins the race in a nail-biting photo finish, virtually winning Christopher the coveted contract with the DCT. John Ross stands defeated as Pamela sides with Chris for the sake of Ewing Energies. Team Christopher/Bobby gets another win when Ann and Bobby arrive at Southfork to find Emma there asking to stay. Ann joyously embraces her daughter. At the darkened offices of Ewing Energies, a glum John Ross shares his tale of woe with his daddy over the phone. J.R.’s been working on a masterpiece plot that will turn the tide in John Ross’ direction again, he reassures his son. Suddenly John Ross hears footsteps and gun shots on the other end of the call! Time has finally caught up with old J.R. Ewing! Next up: the funeral of Jock and Ellie Ewing’s first-born son, John Ross Ewing Jr.
← Flashback Friday: How Gary Ewing evolved from Dallas’ prodigal son to Knots Landing’s resident ladies’ man.